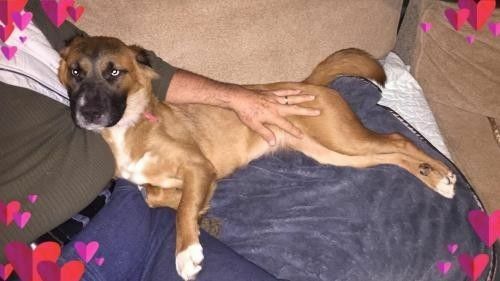 This highly intelligent and friendly female husky/German shepherd mix needs a home, preferably with a person who has experience with intelligent, energetic dogs, such as the husky breed. She adores her humans—so much so, that she NEEDS to feel she is part of the pack and will do anything to be with them. Once she is with her humans, she is calm and loving. (See video.) The husky in her makes her a high-energy dog, so should be exercised daily to release some of that pent-up energy. She gets along with all other dogs, but if not exercised, she will become grouchy towards other dogs as she vies for human attention. She should be fed separately. History: Her history, although sad, is not as bad as some of the animals we have rescued. She was just a puppy when she and her siblings were thrown out on the streets in Tijuana to fend for themselves. A person took them in, even though she didn't have the means to provide them with vet care, or even feed them. Still, she could not leave them alone on the streets where they would have surely perished. So, she took them all home and did the best she could. However, when Chata had fallen ill and was actually in somewhat of a state of starvation. As such, her rescuer reached out on social media to ask for help. Crossing Guardians agreed to take her into our rescue so she could receive vet care she needed and placed with a temporary foster. Chata has since recovered and is now healthy. She started receiving her series of puppy vaccines and rabies vaccine. One done, she will need to be sterilized. Chata is ready to be adopted now. Crossing Guardians will cover the costs of the remaining series of puppy vaccines and rabies vaccine, as well as for her spay. She is house trained to go on the newspaper. She learned in only two days. It shouldn't take long before she learns out to go outside to do her "business." Although there is an amount for the adoption fee, Crossing Guardians does not charge an adoption fee. However, out application process and due diligence is rigorous. Potential adopters must agree to the stringent terms of our adoption application. That constitutes the consideration of the adoption contract. Thank you for choosing rescue!